Writer/director Joseph Mankiewicz famously said that the difference between movies and life is that movies have to make sense. The arc of a storyline with a beginning, middle and end, with actions and consequences, is itself a way of imposing order on chaos. Crime is a disruption of the order we attempt to impose through law, and we resolve that tension by finding out who, and, if we can, why. Sometimes, though, there is a meta-take where the answer is that there may be no answer, or the answer doesn't matter, and the quest for resolution only brings more chaos. 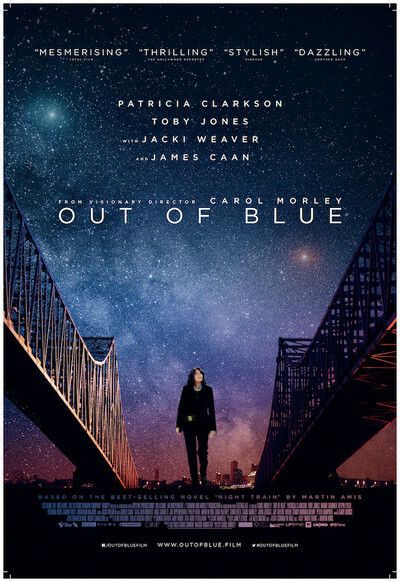 “Out of Blue,” adapted by director Carol Morley from the 1997 Martin Amis novel Night Train, has a self-consciously artsy screenplay with meta air quotes around its air quotes. He sets the quintessential quest for truth, a murder mystery, in the context of literal questions about the nature of the universe, or, more accurately, universes. If some astrophysicists believe that there are an infinite number of universes with every possible variation of our lives occurring simultaneously, then how much can it matter whether we find the answers in this one? If Schrödinger’s Cat can be both alive and dead at the same time in the sealed box, is there even a murder to solve? Detectives arrive at the scene of a death at an astronomical observatory. The body on the floor was an astrophysicist named Jennifer Rockwell (Mamie Gummer). “One of the Rockwells?” someone asks. Yes, the daughter of a prominent family led by a former POW turned electronics magnate named Colonel Tom Rockwell (James Caan) and his wife, Miriam (Jacki Weaver). Their twin sons went into the family business, but Jennifer became a scientist who looked to the stars for answers. “The catastrophic death of a star brings new life to the universe,” she tells a small group of students just before her death. We will hear her again, in flashbacks, describing her search for the “dark heart” that will reveal the secrets of black holes. She cautions that we are not the center of the universe, and an epigraph before the film tells us that we should not think of ourselves as living in the universe but the universe as living in us. The detective investigating the death is Mike Hoolihan (Patricia Clarkson), a recovering alcoholic who says that she cannot remember anything about her past before she joined the police force. In case we cannot figure out that this means she is dedicated investigating the details of other people’s lives but not her own, Amis gives us a character to explain that to us. The same with the parallels between a detective following clues to solve a crime and a scientist following clues to test a theory, and the references to masks and personae, all of which are more than made clear by the film itself and then unnecessarily explained to us by its characters. That happens a lot in this film, where what may have worked in literary prose comes across as pretentious on screen. The central concern about who shot Jennifer Rockwell is resolved pretty quickly, which means “case closed” for the police department. But Hoolihan wants to know why, and so she keeps looking. A female detective with a man’s name, who is told by another character she should look more like a woman, and takes pride in her reputation for never showing any queasiness or emotion at a crime scene suddenly starts getting dizzy. Is she investigating what happened to Jennifer or what happened to her? Weaver is a standout as a mother who at first natters on about Jennifer as a baby until her sorrow leaves her nothing but the truth, and Jonathan Majors as Jennifer’s colleague shows impressive ability to convey a great deal in his few scenes. Hoolihan finds it suspicious when his response to learning of Jennifer’s death is not “How?” but “Why?” And yet, that is where she soon finds herself—in both senses of the term. The problem with giving us a mystery and then telling us it does not really matter is that we end up wondering whether that message itself really matters. In “The Big Sleep,” a likely influence on Amis for both the novel and the film, director Howard Hawks and author Raymond Chandler knowingly left one of the murders unsolved because the real story was about the detective, not the crimes. Perhaps in one of the alternate universe versions of this movie, the characters come across as human beings acting out of understandable motivations. But the version in this universe tries too hard to both be a part of—and comment on—the genre of crime stories, and does not succeed at either.